Thanks to Eleanor and Bill for putting an appropriate literary theme on my few days in the Caravel. Like Howl’s Moving Castle, the Caravel never paused for long in this recent chapter of its four-decade adventures. The saga left off on Friday, when I was making a coffee last for three hours so I could recharge my stuff and get some work done. It was a beautiful sunny day and things were going well. After the work was done, an electronic trail of crumbs (a waypoint stored in the GPS) led me back to the campground, otherwise I might never have found it again. I spent all of 10 minutes installing the new braided-stainless hoses in the Caravel’s bathroom and — ta-da! — no more leaks. Or so I thought. That afternoon the bulk of the rally participants showed up and things got lively. Among many other people, I ran into Tiffani and Deke of “Weaselmouth,” who I’d last seen at Alumapalooza in May, and we got into an evening-long conversation during the potluck dinner. I went back to the Caravel that night pleased that the rally was turning out well, but a little sorry as well because it would be time to get going homeward soon. The rest of the people were just getting started with their Halloween decorations and friendly yakking. For me, the Moving Castle (aka Caravel) was destined to depart in the morning. I lingered on Saturday until about 10 a.m. while the gang was cooking up a huge breakfast outside at the pavilion. People kept asking me how far I had to drive to get home, and when I said, “Oh, about 1,000 miles” the second or third time it really hit me: I’ve got to get going. There were about 16-17 hours of driving ahead of me, plus stops, and very little of it would be interesting driving. Like the little Bubble I pulled from Santa Fe, the Caravel is a joy to tow. There’s no fuss, no bad behavior, no complicated hitching equipment. I try to keep the fresh water tank at least half full to give the trailer better stability, but otherwise I just drop it on the ball and away we go. I don’t trust it as much as I do the big Safari with the Hensley hitch, because I know the Safari absolutely cannot sway with that setup, but the Caravel is marvelously stable at any speed I care to drive. Of course, it is equipped pretty close to the original factory configuration. Often I’ll see small vintage trailers that tow horribly, and inevitably it’s the result of owner modifications (air conditioners, rear-mounted spare tires, altered floorplans or heavy household-style cabinetry) that corrupt the delicate center of gravity. The original designs took care to ensure that when the trailers were loaded with water, food, personal items, etc., the trailer would remain stable. I made a few stops along the way for errands. The day before the GL320 gave me a warning that it wanted a top-up of “AdBlue” fluid, which is also commonly known as Diesel Exhaust Fluid. These days you can find the stuff in any auto parts store, truck stop, and even some Wal-Marts, and it’s cheap at about $12.99 for 2.5 gallons. I put five gallons in the special tank that holds the AdBlue, which should be good for another 7,000 miles or so. I’ll top it off this week for a full 15,000 mile range. I mention this only because a lot of people are still scared about the stuff, thinking it’s expensive, or complicated, or frequent, and it’s really no much more hassle than filling the window washer fluid. Three-tenths of a cent per mile is a small price to pay for clean diesel emissions, in my opinion. I’ve wanted to spend a night at Monahans Sandhills State Park (just off I-20 a little west of Odessa TX), but the timing has never worked out before. This time I hit Monahans about a half hour before sunset, which made it a great stopover point. The park has only 26 spaces, which made me think I might get skunked on a spot since it was Saturday night, but it turned out to be only about half full. About half of the spaces are short back-ins that were perfect for the Caravel but wouldn’t have worked for the 30-foot Safari. I have to take this opportunity to gripe about a small thing. Many state parks use an honor system for late arrivals. You fill out a little envelope and put your nightly camping fee in it. This envelope gets deposited into an “iron ranger” (a metal box) and picked up by the staff daily. You have to indicate your campsite on the envelope, but you haven’t gotten a campsite yet, which means you have to go to the campground, find a site, then come back to the iron ranger. At Monahans the iron ranger is at the entrance gate, but the campground is about 1.3 miles away. By the time I was parked in the site, it was nearly dark. Being an overnight stop I would have preferred not to unhitch but I also wasn’t psyched to walk 2.6 miles roundtrip in the dark along a narrow, winding, shoulder-less road in the cold. I wanted to make dinner and fire up Calcifer, and I also needed to refill the water tank. To get it all done quickly, the easiest thing was to unhitch and drive back to the entrance gate to deposit my envelope. Other state parks set up two iron rangers, one at the gate and one at the campground for the convenience of their visitors, so there’s my suggestion to the powers-that-be. The morning found me with 555 miles to go. I debated whether to plow ahead or to stop along the way. There were places I would have liked to stop, and friends to visit, but there was also a place I wanted to be more, namely home with E&E. 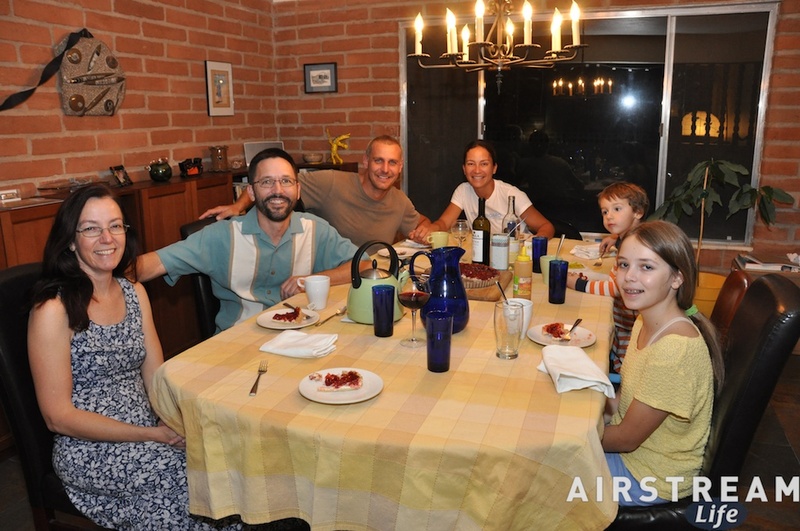 Back in Tucson they were decorating the house for Halloween, and Eleanor was cooking things. On the other hand, in the Caravel I’d discovered yet another leak, this time under the kitchen faucet. I took this as a sign that I needed to get back to home base and have a long chat with the Caravel (wrench in hand) about its incontinence problem. To be fair, the trailer is doing spectacularly well, especially considering its age. (The leaks are all from the same type of flexible plastic faucet hose, at the compression fittings. I don’t know if they are failing from age, heat, bad design, or over-tightening, but they are all getting replaced this week.) Other than that, the Caravel has performed admirably. We covered 1,000 miles at highway speeds, and encountered some pretty awful back roads too. Not a rivet was disturbed on its tight little structure. More important, I was entirely comfortable through the entire trip, with my little aluminum soap bubble to house me at night and Calcifer to keep me warm. No matter how much I had to drive, at the end of every day I knew I would be back in my home, with my familiar things and favorite foods waiting. 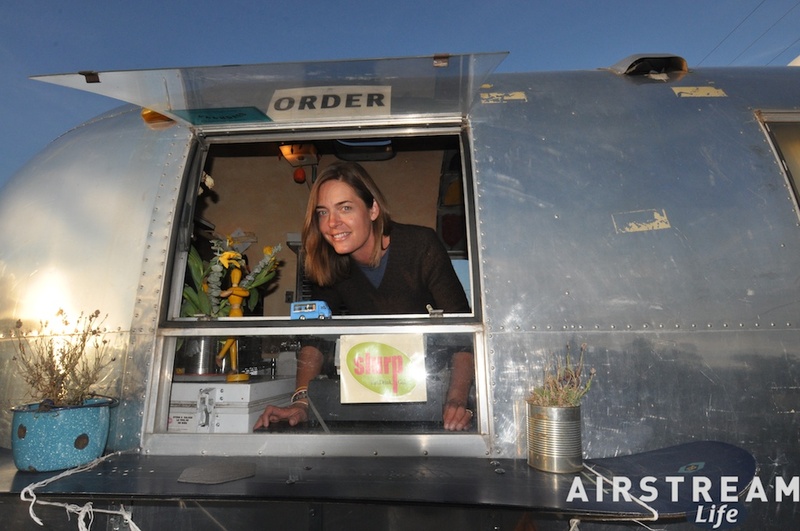 An Airstream really is a moving castle, where you have everything you need with you no matter where in the world you go. This is the magic of trailer travel. Even though I just finished unpacking from this trip, I’m looking forward to the next one already. Most likely it will be in mid-December. The Caravel is a wonderful trailer, into which we’ve lavished attention, parts, and buckets of money, but still it has a few bats in the belfry. (Note: Halloween-y reference in appreciation of the upcoming holiday.) I fired up the water heater in the morning, took a shower, and discovered several new problems. Problems are to be expected in any travel trailer as a result of time, miles, or — worst of all — long-term storage, but it just seems that at some point I should get into it and find that everything works as expected. So far, no luck on that one. In fairness, the problems are small: water leaks in both of the supply lines leading to the bathroom faucet, and another water leak at the water heater output line. It’s not that the issues are big or expensive, it’s simply that they are there when they shouldn’t be. None of this plumbing leaked last April when I last used the trailer, and it’s only a few years old. So what happened? Well, storage happened. There are some types of plumbing that are better than others for long-term reliability. Nearly every part of the Caravel has been replaced or renovated in the past few years — except the plumbing. It looked good, so we left it, and that has turned out to be a mistake. I think these leaks are number 5, 6, and 7 since we put it back into service about two years ago. Every compression fitting seems to be failing, possibly as a result of thermal stresses (heat in the summer, cold in the winter) or maybe just age. Some have been fixable with teflon tape, others have required outright replacement. The other plumbing surprise was the smell of the hot water. Yikes. Imagine a mixture of onion, wasabi, and sulfur, and then take a shower in it. Phew. It was a result of leaving the trailer in storage all summer. I should have drained the water heater before storing it. Fortunately, I didn’t smell like it when I came out of the shower. After that experience, we drained the hot water tank and flushed it out with fresh water, which seems to have mostly eliminated the issue. I’m going to do a full flush of the system and sanitize it when I get to a full hookup campground, or at home, whichever comes first. So with the emergency tweaks done, we lined up the rigs in the driveway and set off. There were three of us: Paul & Anne’s 1955 Cruiser, my 1968 Caravel, and Pat’s 1966 Globe Trotter. We paused in Decatur for lunch at the Whistle Stop Cafe and then headed up to the Grasslands, in a steady cold drizzle. There’s not much positive to say about the first night, unfortunately. It was cold, windy, rainy, and a little muddy. 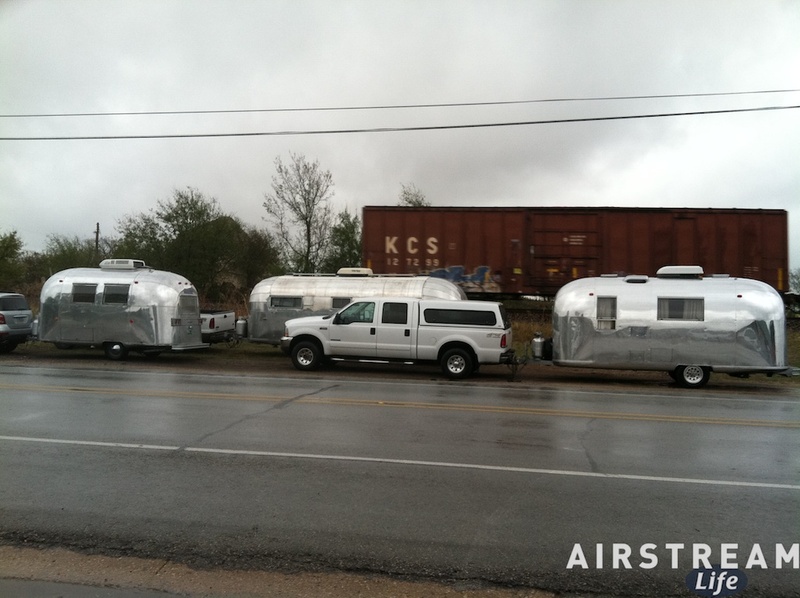 Six Airstreams were parked at the primitive campground we are using in the Grasslands, and all of us hunkered down for the night with the heat on (well, those of us who have heat –Paul never got around to installing his) and stayed inside. I watched a movie and studied some travel books I’d brought. The catalytic heater was my best friend, hissing quietly and glowing dimly all night long. Today, however, is another story. The weathermen were right: it is sunny, cool, and dry, and the wind is gone. It’s the kind of weather that Texans have been waiting for all summer. 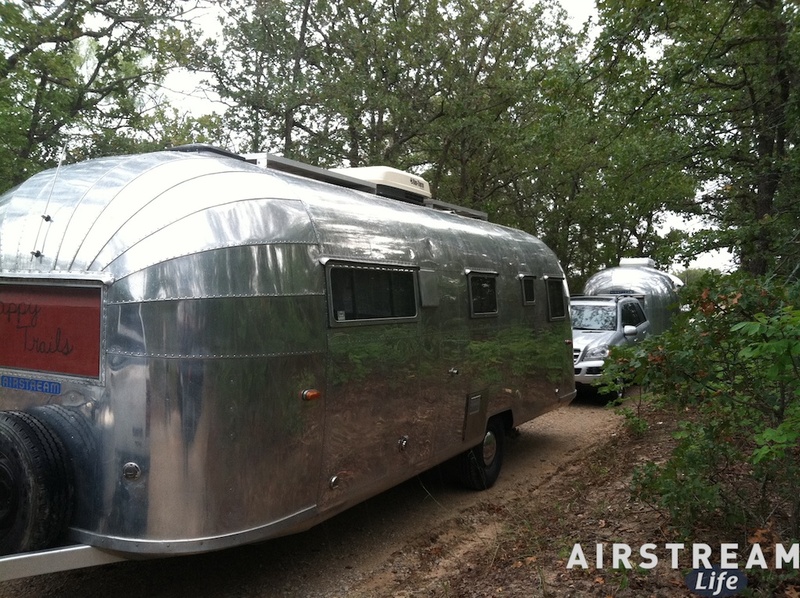 Airstreams are trickling into the campground for the weekend. I have no idea how many we are expecting, but when I left this morning there were 10 already. I took off for a few hours in nearby Decatur to get the parts needed to fix the rest of the Caravel’s plumbing issues, and to take a couple of hours at the local Starbuck’s to catch wifi and charge up the laptop & phone batteries. That’s where I am now, milking an iced decaf Americano with cream and hazelnut as long as possible. This afternoon I’ll install the new pipes in the Caravel. Tonight there will be a potluck dinner and I expect to find a few friends will have arrived when I return to the campground, so it should be a much more interesting evening than yesterday’s dark & stormy night. Hey, a day that went entirely according to plan! That almost never happens, and especially when the plan includes a nearly impossible sequence of events like today’s did. I started up at 5:30 local time in Santa Fe (an hour earlier than Tucson time, so 4:30 to my body clock). I was the first guy at the motel’s continental breakfast at 6:10 a.m. While I munched a bowl of cereal and yogurt I watched the local weather guru predicting a sharp drop in temperatures, gusty winds, and probably snow showers in the coming evening. Time to blow out of town, I thought. And so I did, with the ’56 Bubble complacently tagging along. The trailer towed like a dream all day, even (once I adjusted the tongue weight and got my courage up) at a rollicking 70 MPH along the byways of west Texas. I kept checking the tires, the bearings, the hitch, and the lights, but found no problems at all. The only minor issue was that a window cracked early on, which I taped up. It was probably caused by flexing of the trailer body. The trailer is known to have some floor rot, which will cause such issues. I can’t blame it for being a bit crotchety, after all it has been on the road for more than half a century. Eventually it will be all fixed up and I am looking forward to seeing it. Fast-forward 520 miles: I landed at my destination in Texas by 5 p.m., dropped off the trailer, visited with my friends for an hour, and pushed on 100 more miles to Paradise TX. It was 8 p.m. by the time I arrived at Paul & Anne’s house, pitch-black out there in the countryside, and I found the Caravel neatly parked in the same place we had parked our Safari just about a month ago. It was plugged in, with a full fresh water tank, and the refrigerator cooling. After 1140 miles of driving in the past two days, the warm glow of the Caravel was a welcome sight indeed. Now I’m set up inside, refrigerator loaded with drinks and snacks, my clothes put away, laptop and wireless Internet all set up, bed made — in other words, Home Sweet Home. But I get only one night to relax because sometime tomorrow I will be hitching up and following Paul, Anne and Pat (in a third trailer) over to do some early setup for a weekend rally in the Grasslands. The weather is supposed to be abysmal tomorrow (rain, 54 degrees) but who cares? The early arrivals at these things are always good people to hang with — and if I don’t feel like going outside I can stay inside the Caravel and watch the rain while I do a little catchup work on the computer. Now that the hard part of this trip is done, it feels like any small challenge I might face in the next couple of days will be absolutely nothing. It has been a good day. I launched from Tucson about 8 a.m. and figured I had plenty of time to make my 5:30 appointment in Santa Fe. The weather was as perfect as I’d expect from the southwest in October, traffic on I-10 was light, and at 75 MPH (the speed limit) it looked like smooth sailing. Alas, I forgot that this time of year it’s an hour later in New Mexico. Arizona doesn’t observe Daylight Savings but New Mexico does. Drat. I trimmed my breaks to the bare minimum and opened up the throttle a tad. The GL’s great range meant that I wouldn’t have a fuel stop all day, and Eleanor had packed snacks for the car, which meant that in 500 miles I only stopped three times for about five minutes each. It all worked out. By 4:30 I was in Santa Fe. So I was an hour early for my appointment downtown, which gave me time to go check out the Bubble. It was parked in a storage lot amidst a forest of weeds and sandspurs, which made kneeling down to check the underside a literal pain. It had a cracked window, a bit of drooping belly pan (which I’m going to keep an eye on), the brakes don’t work, and the interior is gutted. But it’s a cute little thing, only 15 feet long, and it’s one of those trailers that has obvious potential for an owner who cares to invest a lot of time and/or money. I like it but I like the fact that the Caravel is done, more. I taped the cracked glass, attached the temporary Texas ferry permit, and tested the 7-blade to 6-pin adapter to make sure the lights worked. All good. Since my next stop was downtown, I didn’t want to take the Bubble just yet. In town I met Rebecca, who co-owns a food trailer called “Slurp.” We had a very rushed photo shoot, trying to beat the sunset, and then I headed back to the storage lot to hitch up the Bubble. It was nearly dark, so I worked by the light of a headlamp. That’s when I discovered that the hitch mount I had brought was too low for the trailer. The ball needed to be removed and installed upside down so that instead of yielding a two-inch drop, the mount would give a 3/4″ rise. They’re designed for that. I was patting myself on the back for being ready for this possibility. I brought with me a massive wrench specifically for the nut on a hitch ball. Problem was, I couldn’t get the nut off. I fought with it for a while, and then of course the rain started. That’s how it goes, from self-congratulation to humbleness in just a few minutes. Eventually I got the nut off and completed the hitching job, installed the temporary license plate, and gave the whole trailer a good look-over one more time. Then I slowly towed it through the lot with the windows open to listen for horrible sounds of impending mechanical failure (there were none), paused a few times to check that the umbilical line wasn’t binding, and got going to the hotel for the night. Tomorrow will be another big day on the road. The trip plan calls for 520 miles and they won’t be fast ones like I enjoyed today. The tires on this trailer are from 2004, and atop that I am not yet sure that there’s sufficient tongue weight in the trailer (because it’s gutted). Insufficient tongue weight can cause a dangerous sway at speed. I’m going to load all my heavy stuff into the front of the trailer in the morning just to add some insurance, and I’ll be stopping several times in the first hour or two, to check everything over. But I have to admit that I already like this little trailer. It’s cute as a button, light as a feather, and it seems to be happy behind the Mercedes. Tomorrow I wouldn’t be surprised to get a few thumbs-up from people on the highway as we toodle along through Texas. 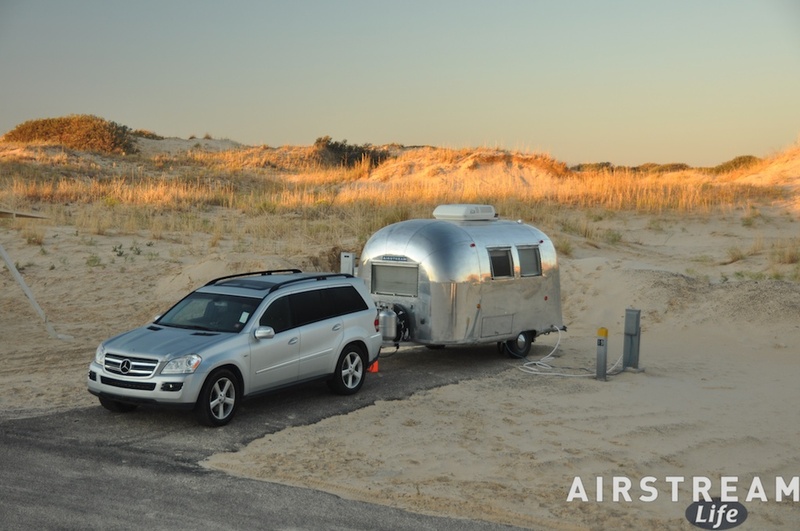 Our lives have been so centered on traveling with our Airstream that when we don’t have travels planned it’s sometimes a struggle to figure out what to do. The blog goes quiet (you may have noticed) while we take care of the non-traveling part of life and find our footing. Fortunately, the feeling of being adrift never lasts for long. We arrived in Tucson less than three weeks ago and spent the first week just digging out from the piles of work that had accumulated while we were traveling. Both Eleanor and I try to keep up with stuff, but there’s no doubt that traveling for short periods is actually harder than full-timing. With a short trip there’s the temptation to let things slide while you rush around to make the most of the time you have away from home. When full-timing, there’s rarely any time pressure, so we never minded pausing for a week or two to catch up on life. The beach was still going to be there when we got the laundry done. This last trip was different: it was loaded with obligations and tight schedules, and we were rushing to get back to Tucson. But a week after we arrived, the bulk of the obligations were resolved and suddenly we were looking for things to do. So we began talking and planning, and reaching out to friends. In retrospect that might have been a little early for us. I discovered that our friends Ingo and Ehiku were going to be coming through I-10 on their way to California, without their Airstream, so I invited them to spend a night in our Airstream, which is fully hooked up in the carport as always. They accepted, and suddenly we were faced with a weekend of rapid cleanup, because the house and Airstream were both disaster areas. Well, at least it forced us to get it done. They came by on Sunday and shared a big bowl of bucatini with a meaty homemade sauce with us. The next day after they were gone Eleanor and I went out to the carport, and spent a moment reveling in the coziness of our immobile Airstream now converted into a guest apartment. She had set out little treats on the dinette, a selection of teas and coffee on the kitchen counter, and drinks in the refrigerator. The air conditioning was keeping the interior at a comfortable and dry 78 degrees. The beds were made with fresh sheets and everything had been cleaned. 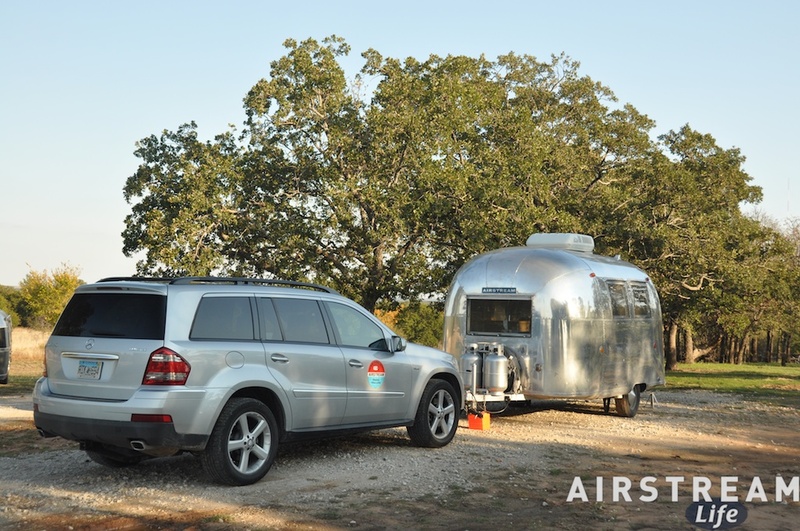 “Why,” (we thought) “do we only let guests enjoy this space?” The Airstream is at its best when it is parked in a beautiful place — and also in the carport at home. It has that wonderful secret getaway feelings of a kids’ tree house: no adults and no concerns allowed. (Girls are OK.) We’ll have to spend some time there. 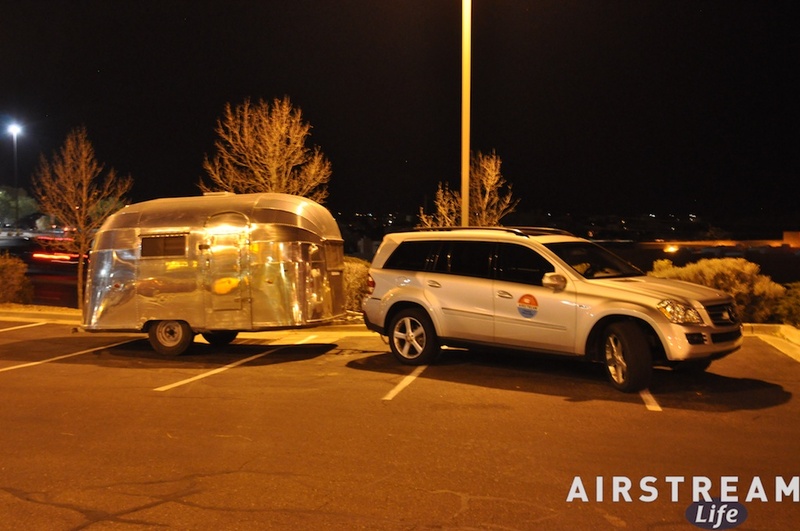 We will have the clubhouse for a while, because the Airstream is going to stay parked until at least Christmas. But that’s not to say we’ll be stationary. In the aftermath of our overnight visitors I began thinking about all of the things I want to do this winter … and that led to a big planning session that has consumed much of the week. The first trip will start tomorrow. I’m finally going to retrieve the 1968 Caravel from Texas, so we at least have a chance to use it in southern AZ or CA before the nights get too long and chilly (our brief “winter” in December and January). In the interest of avoiding boredom on the Interstate, a few stops are planned s that it will be more than a straight-line trip. In fact, the first stop will be Santa Fe, where I’m stopping to photograph a trailer for a future magazine article, and pick up a ’56 Bubble for a friend. I don’t normally ferry trailers around but in this case it was sort of on my way and it seemed like an interesting challenge: pick up a 55 year old trailer that hasn’t moved in a year and tow it 500 miles to a new home in Texas. So many things can go wrong. All I know about this trailer is that it has recently had the wheel bearings re-packed, and the tires date from 2004. Typically when you find an unrestored old trailer you’ve got to be prepared for all sorts of problems. Do the lights work? I’ve had belly pans separate on the highway, dragging on the asphalt. I’ve had brakes fail, and ball couplers rusted solid. When Rob B was ferrying my 1953 Flying Cloud through New York a few years ago, the wheel bearings disintegrated and he had to ditch the trailer in someone’s front yard until parts arrived. Last year I helped a buddy move a trailer out of Austin and the front end of the trailer had separated so much that the body literally bounced on the frame for 200 miles. So I’ve got parts and tools for all sorts of problems, and I hope I don’t need any of them. It would be easier not to do this job, but so many people have done it for me that I feel it’s time to pay it forward. I’d like to think that moving a vintage trailer takes moxie and builds character. But even if it doesn’t, it will be an interesting experience, and I’ll try to blog it as I go.